Evacuation (incl. medical evacuation) – Emergency Evacuation includes medical due to outbreaks, epidemics, threat of natural disaster, political evacuation due to civil unrest (treated separately), and emergency medical evacuation to the nearest qualified medical facility that can handle the medical condition. Includes expenses for reasonable transportation (either public transport or private as reasonable based on the condition) resulting from the evacuation; and the cost of returning to either the home country or the country where the evacuation occurred. Sometimes includes remote transportation in the event of a diagnosis of a critical medical condition which is not necessarily immediately life-threatening, but severe enough that it could result in death or a permanent disability if not treated right away. Any medical treatment (after any deductibles) are usually paid from your medical insurance benefit. May also include an Emergency Reunion Benefit, or Return of Minor Children. If you are worried about emergency evacuation due to where you plan to travel, we’d recommend our Trawick Safe Travels plan. 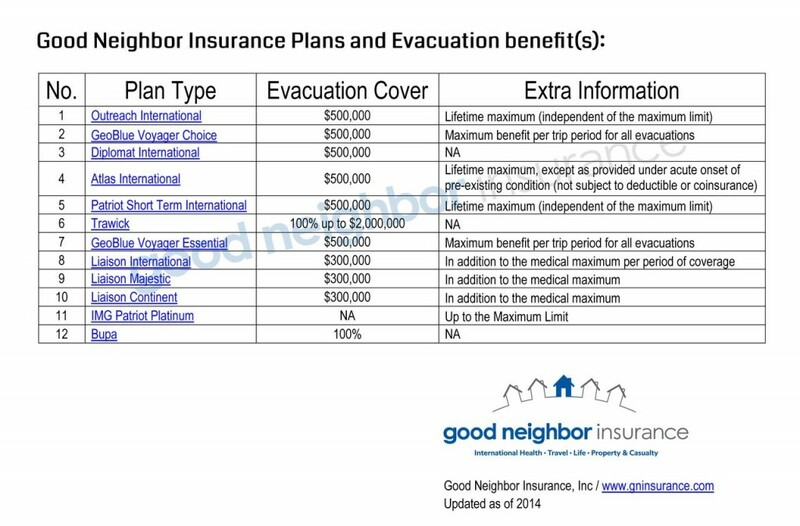 You may also want to consider BUPA or if you’d like having stronger medical coverage and benefits in addition to evacuation, check out our IMG Patriot Platinum Plan.